The two founding principals at Corona Insights began our careers as engineers. We both worked in the aerospace industry for about five years before we met on a Top Secret military project. We fell in love, got married, and together we left engineering as a profession. We went in different professional directions for several years before once again becoming coworkers at Corona Insights. I’ve always felt a little guilty about leaving engineering as a profession. I still use the greatest skills I gained in engineering school, those of critical thinking, problem solving, and speaking the language of math and data. But I also learned a lot of interesting stuff that I don’t use any more. Getting my aerospace engineering degree was the biggest intellectual challenge I’ve ever had, and most of it is just a faint memory now. I get surprisingly few opportunities to use that senior aerothermochemistry class. By leaving the field, were Karla Raines and I an oddity? I’ve always assumed so. Engineering is a good-paying field that has a pretty high barrier to entry and generally stable employment, so why would somebody leave? Well, I recently had a chance to test that theory. I mined some federal census data to see what happens to people with engineering degrees once they get that diploma. 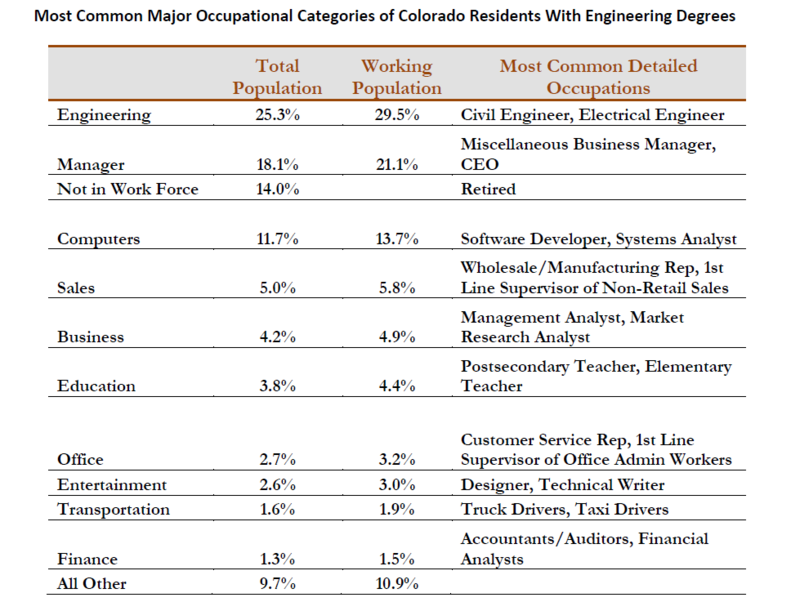 I examined the occupations of 1,250 Colorado residents who hold bachelor’s degrees in engineering, and I compared it against their current occupations. What I found surprised me a lot. While occupations can be defined many ways, I discovered that only 30 percent of employed people with engineering degrees describe their occupation as “engineering”. Now, that doesn’t necessarily mean that 70 percent have left the field. Some may just describe their jobs differently. For example, another 14 percent described an occupation that was computer-related, with 11 percent in fields that are potentially related to engineering (programming, operations research, etc. ), so they’re likely still in a technical field that could be related to engineering. On top of that, another 1 percent describe themselves as scientists of some sort, so they could still be in fields directly arising from their degree. So if we add all of those up, we have 30 percent of engineering grads working as engineers, 11 percent working in technical computer fields, 9 percent working as technical managers, and 1 percent working as scientists. That means that 51 percent of engineering grads are working in technical fields. So what are the rest of them doing? I provide a table below that includes the major occupational fields of engineering graduates of all ages. In my next blog post, I’ll break it down by age. While engineering graduates wander far and wide in their career choices, we see that many of them maintain their analytical interests. 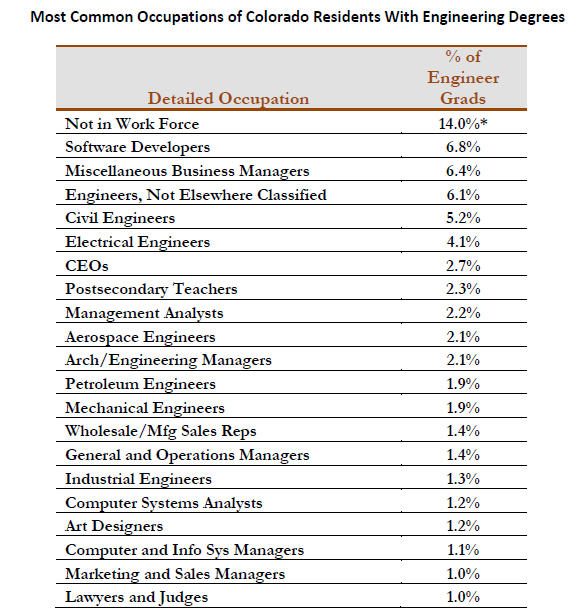 To provide more context, I also examined the most common detailed occupations of engineering grads in Colorado. The top 20 detailed occupations are shown in the following table. * – Primarily older engineering grads who are retired or younger grads who go straight into graduate school. Again, engineers wander far and wide. While many maintain their engineering focus, we see general business managers, art designers, marketers, and even lawyers in the mix. In a future post, we’ll see how that translates to income.